SonjaM put her bike history on her blog. I thought that looked like fun so here is mine on my blog. Besides, what are you going to do when it is snowing outside? My first bike was a Suzuki TS 125 I did have a helmet, but ATTGATT in those days was usually levis and a pull-over. 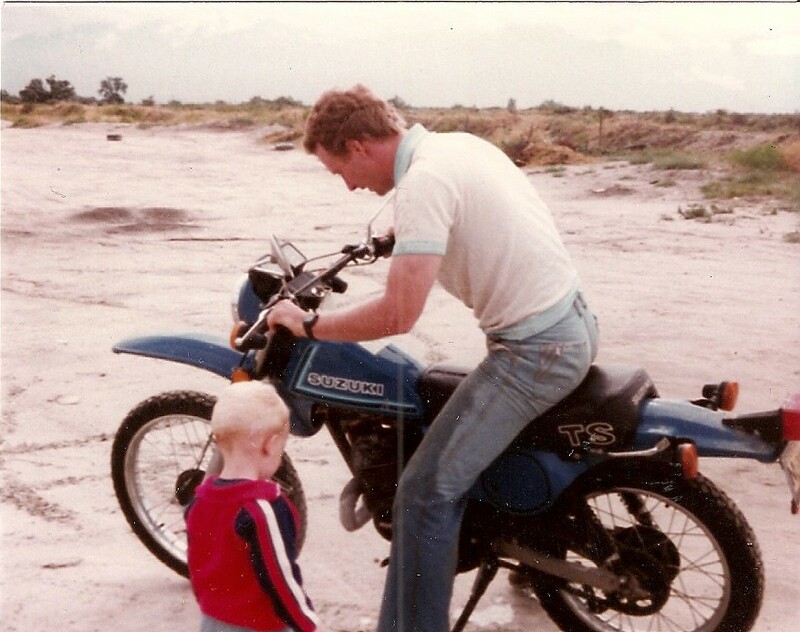 This picture was taken circa 1984 and was just after I rode through a canal; my young son (now 29) is looking on while I try to get it started again. Pulling my kids and nieces and nephews around in the snow. 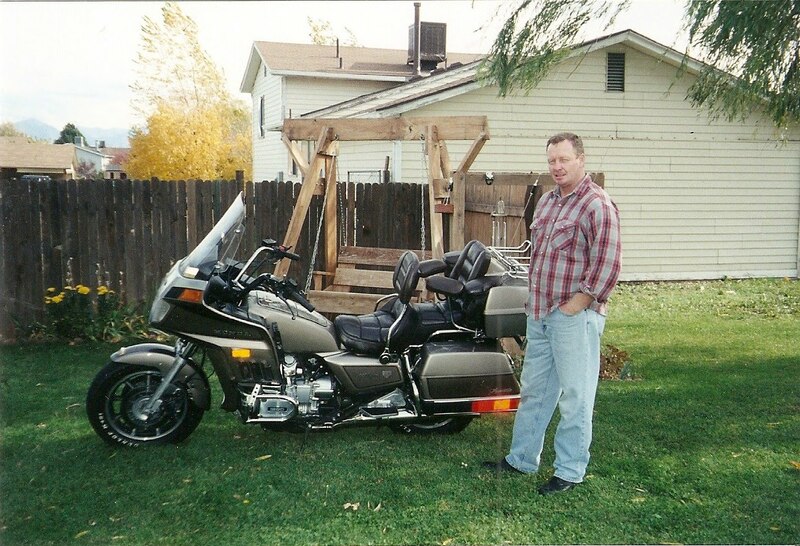 I took the next decade off from riding, and then got this bike, a 1984 GL 1200 Interstate. 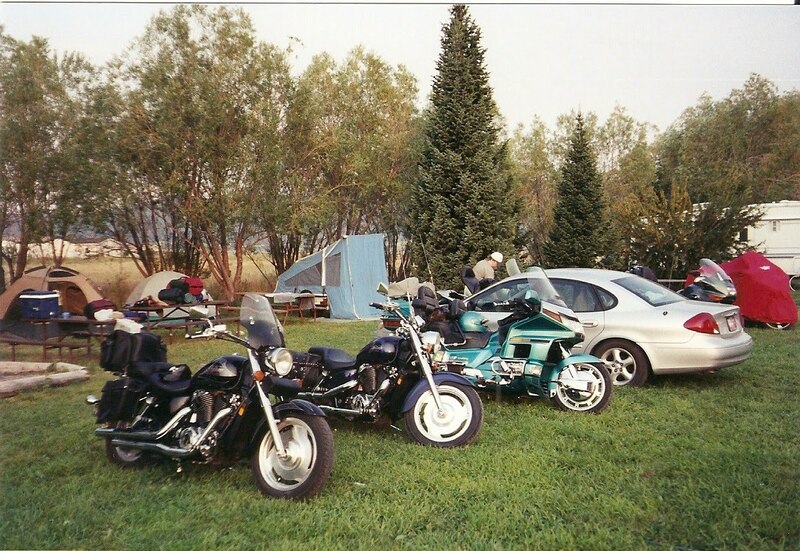 Also in this pic is my third bike, a GL 1200 Aspencade. 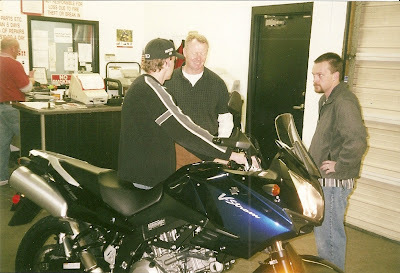 I had the black one for only about a month before getting the Aspencade, and put about 1,000 miles on it. 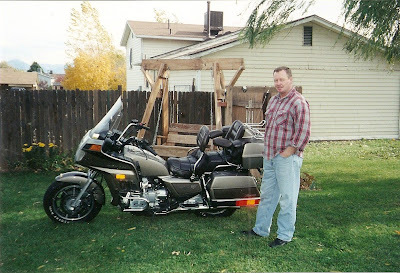 I rode the Aspencade just over 20,000 miles, in the year that I had that one. 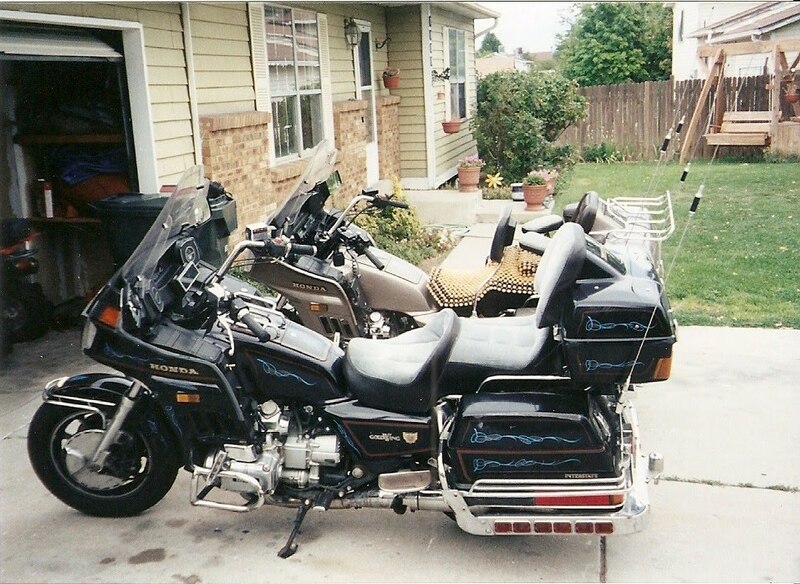 This is my forth bike and third wing, a 1994 GL 1500 SE. What a beaut! I got the SE in 2002..I think, and had it for 3 years putting 61,000 miles on it. 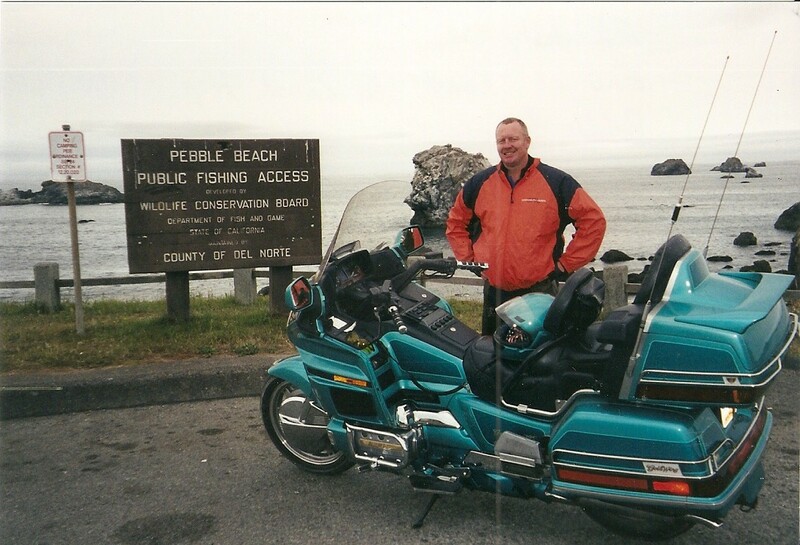 This picture was taken in Crecent, Ca, at the end of a coast to coast jaunt. The wing is a great bike to tour on, long days are comfy, cold days are...well, cold, but easier to do on a wing than other bikes. Someday I suppose I"ll own another wing. 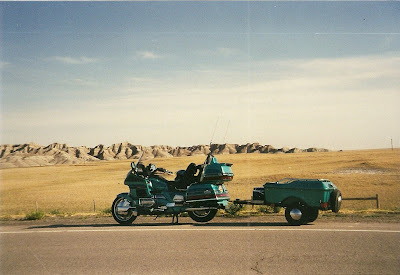 Somewhere in South Dakota, I had started out in Boston two up, my wife flew home from Niagra Falls, (as per our plans, someone has to work!). 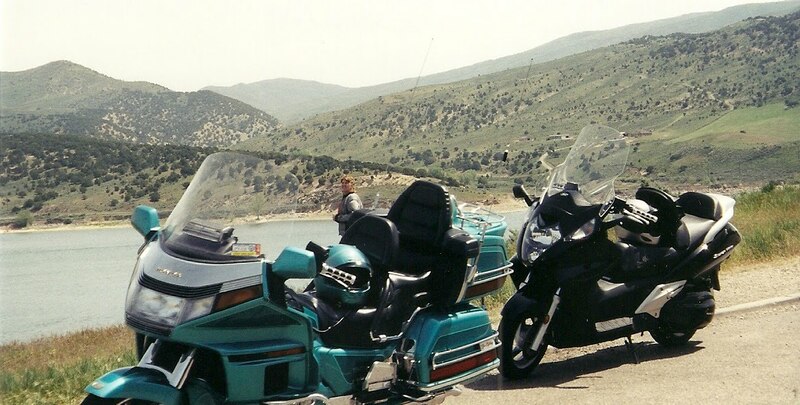 Then the family joined me again in Utah and we went to the west coast with three bikes and a car. 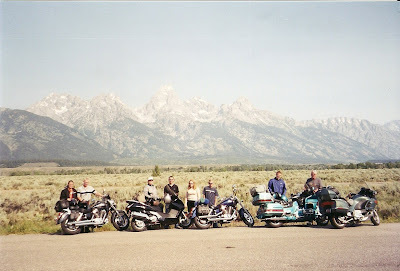 22 days, 21 states, beautiful ride! The wing with Beverly's Silverwing scooter. Near Emigration Canyon, Utah. A family trip. 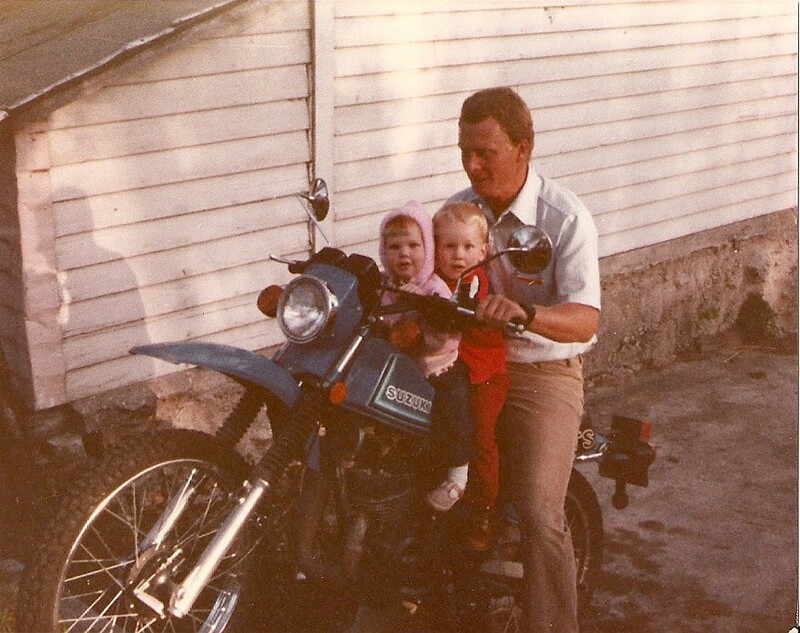 Two sons on their Honda Shadow 1100s, Beverly on her Silverwing, Me on the Wing, and a family friend on the Beemer. 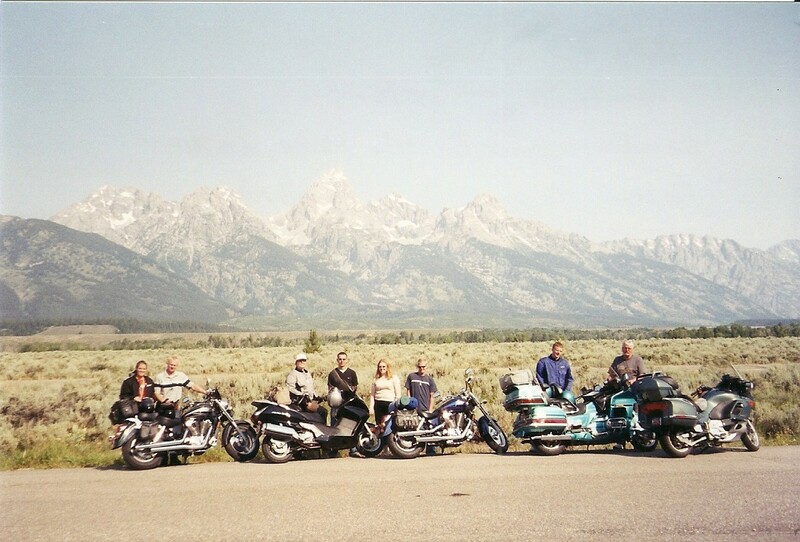 The Tetons (Wy) in the background. 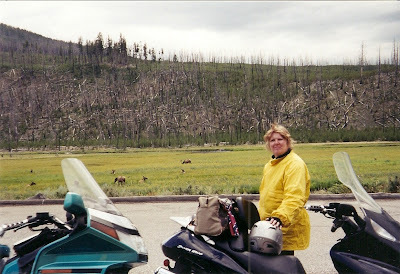 We are headed for Yellowstone NP, then Beartooth Pass. Beverly, and elk herd across the road in Yellowstone. 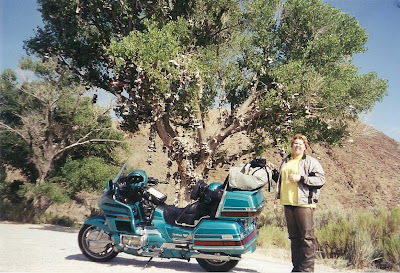 Another family trip on the way to Oregon - the "Shoe Tree" on highway 50 in Nevada. Our destination, Depoe Bay, Oregon. Three sons, the two shadows and the third is riding the Silverwing. Number 5. Sold the Wing and got this Suzuki V-Strom DL 1000 aka "Blue". Another Daddy/Daughter ride. I ended up putting 52,000 happy miles on Blue. This Harley Sportster 883 was my bike for only a day. 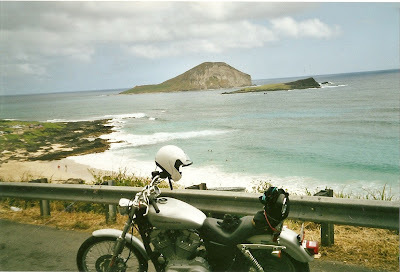 While in Hawaii I rented it to take a day ride around the island. Bike 6. Another V-Strom DL 1K I still have this bike, so far I have 42,300 miles on this one. With a few farkles the Strom is a great touring bike. Two of my sons and I rode over to the Barber Motorsports Museum in Birmingham, Alabama. On a wet and muddy day ride across part of the Pony Express Trail in Utah. Number 7. 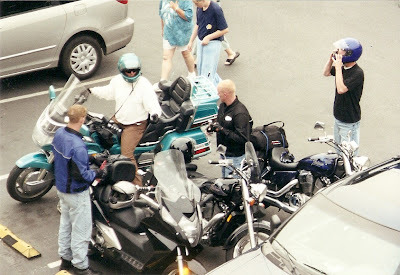 A Kawasaki Nomad. I still have this one also; so far 17,200 miles. The Nomad is a great touring machine. 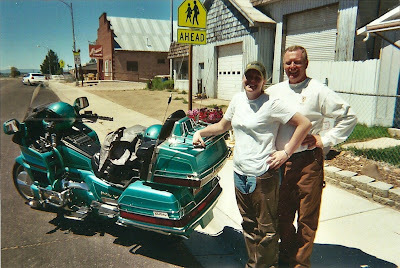 Among the many good people in Southern Utah are Suzi her husband Rob, and Bob. When I mention I'd like to ride some new (to me) roads around St. George they offer to show me around. How can I resist? Time for a ride. I depart home at 2:30 Tuesday, and because I'm starting so late I have to take the freeway for the entire 299 miles to St George. I fill up at Nephi, and don't touch the ground again until the first stoplight on Bluff Street in St George. 225 miles in the seat, a new record for me (where's the bathroom?!). I go to the condo I have reserved and here is my home sweet home for the next three days. I took a pic of the second bedroom, closed the door and didn't see it again. This should have been my bed, but I slept on the couch...old habits and all that..
"Hey look, there's Ken...how long have you been standing there?" I'm just kidding of course, both are good friends and GREAT hosts! They pulled out all the stops to show me a super riding day! If I win the lottery, I'm moving here. And off we go, taking the back roads to Mesquite, Nv. At rest/photo stops Bob tells the names of the mountains, what animals are where, and so on...where is my tape recorder when I need it? Suzi shreds the curves...at posted speed limits of course! Joshua trees, or what's left of them; Bob tells me a range fire went through here a few years ago. Suzi and her good looking Gixxer. More charred Joshua trees, the fire was human started. After a long stretch of road Bob gets confused and thinks we are in Oz...Good job M8! 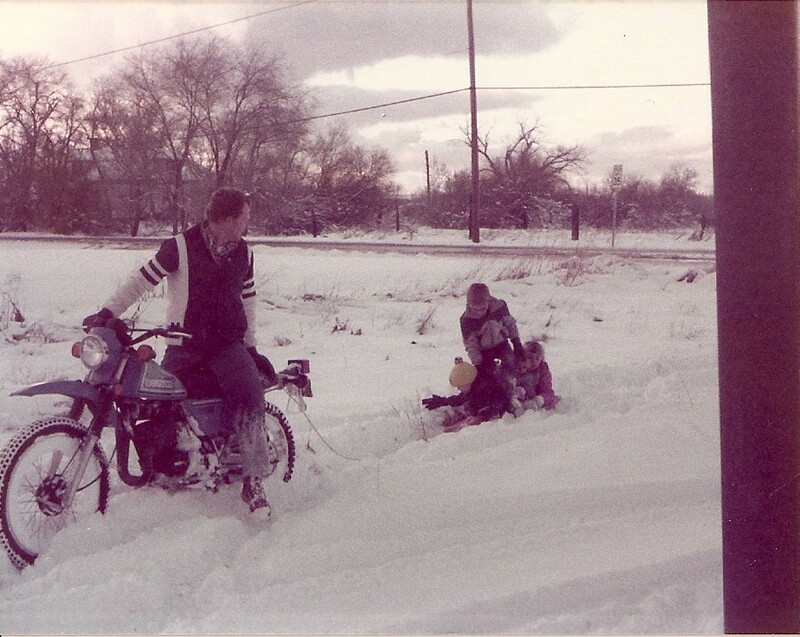 And now I'm confused, I can't remember if this is Littleton Az, or Bunkerfield Nv. or....? The trailer say's "Beaver Dam Jam". All the barren brown makes the trees look even better. Did I mention lots of brown? Our lunch destination...The Purple Fez in the Casablanca casino. Cool place, cool fountain....and me. Back to Suzi and Rob's place to pick up a couple more riders for the second half of the day's ride. Bob has to prepare for a busy next four days at work and so leaves us. Gen chillin in the shade. Off we go; I've followed Rob on this road several times and I STILL can't find it when I'm alone! Note the people standing on top of the cliff.
" On belay!" And down she goes.. The turn off to Kolob Reservior via Kolob Terrace Road. Hie to Kolob! It is easy to see why the pioneers would name this canyon after what must be a very beautiful place. Sunset Canyon Ranch. You can look down upon the ranch from the Kolob road..these pictures just don't do it justice the ranch scenery is stunning! We've entered Zion NP, and can see the 7,395 ft tall North Guardian Angel (the white peak). Red roads mean, entering Zion. A Ducati driver enjoying the day. Allen, Steve, Rob, Suzi, and yours truly. While we stop at the reservior, Suzi takes Steve's "music to my ears" SV 650 for a spin. 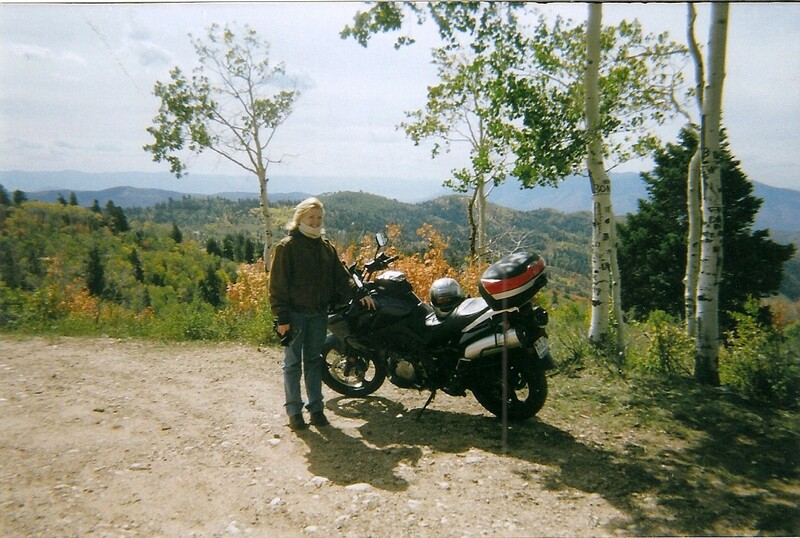 On our way back down Kolob Terrace Road. The 5 mph turn again. Next destination is Mesa road. 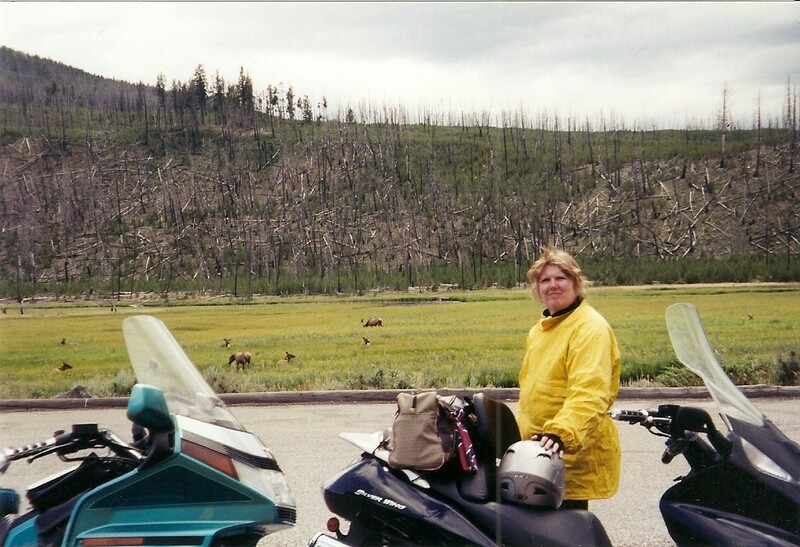 Steve and Allen have to leave us, so now it is Rob, Suzi and I taking on this very curvy goat road. There is an "Abandoned" airport at the top of this Mesa, but well before we can see it we run into a "No Trespassing" sign where we turn around and go back down the road stopping for pixs along the way. We lollygag enough that the ride back to St George is in the dark, but no complaints here, this has been a great day! 200 miles of scenic and mostly new roads for me, thanks Suzi, Rob, Bob, Allen and Steve for a super day! Then Toquerville, onto SR 9 and hang a left onto the Kolob Terrace Road. The 'improved road' starts at the reservior. The dirt road in front.. Old cabin..
And Cedar City from above.. Exiting onto highway 14, I turn right for highway 89. But first I need to remember this sign in case I want to ride the reverse route next time I'm down here. And on 89 Yikes hot brakes! I don't know how I'm going to beat this ride.